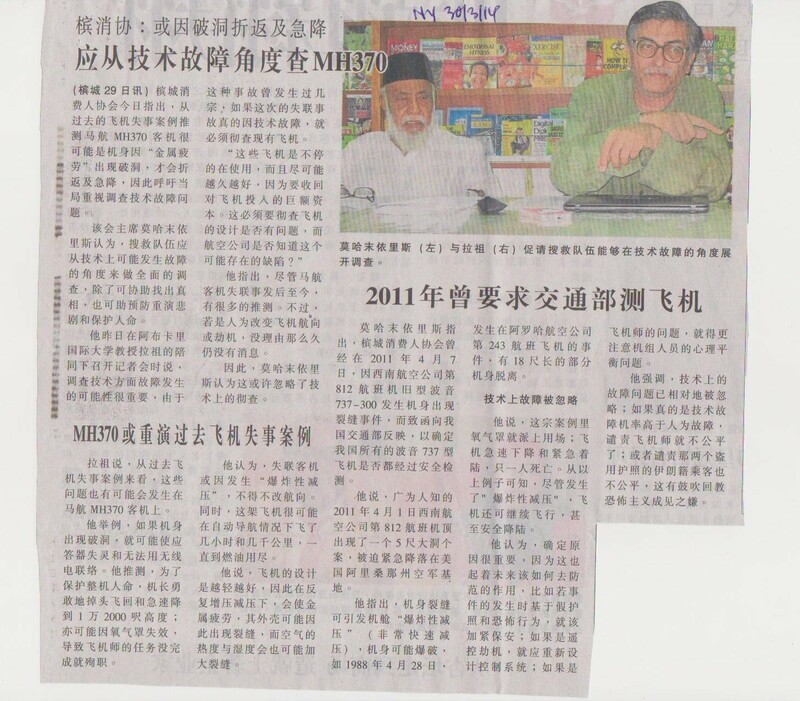 MH 370 has been in the news for some time, so I expressed my views on a visit to Penang, and this led to a press conference the next day. The press has been harping on human factors, terrorists, hijacking by hacking, pilot suicide and all sorts of exotic theories. The terrorist theory was clearly wrong from day one: why should someone intending to kill himself want a fake passport? Hijacking or hacking also does not fit the facts: else there should have been some related demands by now. It is important to understand the correct causes to prevent a recurrence of this tragedy. The most likely possibility is a failure of technology, not human error. Very likely there was structural failure and an explosive decompression. What would the pilot do in that case? He would turn back to Malaysia (hoping to land), and would dive down (aiming to get oxygen back in the cabin, not to evade radar). [Why would a pilot intent on suicide turn back and fly across Malaysia, that too while trying to avoid radar?] Clearly, despite his heroic attempts, the pilot and passengers must have succumbed to hypoxia and hypothermia very quickly. At this stage some people with pitiful faith in technology ask what about the oxygen masks? Obviously they also failed. If the plane cracks open, the oxygen tank and pipelines too can get torn apart. A known example where the oxygen supply failed is the case of Helios flight 522 of 14 Aug 2005 (a Boeing 737), in which all passengers and crew died, and which continued its zombie flight until crash, despite jets being scrambled to intercept it. There is a wrong expectation that the plane would have disintegrated into bits and fallen on the spot. Even if the aircraft suffers explosive decompression, the plane can continue to fly and may even land safely as demonstrated by Aloha Airlines flight of 28 April 1988 in which explosive decompression tore out an 18 foot hole. Obviously, in this case of MH-370 (a Boeing 777-200ER) after the failure of the oxygen supply and the quick onset of hypoxia, the plane presumably continued on auto pilot mode, like a ghost flight, like the Helios flight, until it ran out of fuel and fell into the sea. Clearly, this theory explains all the known facts, and as of now, this is the only theory which explains all the facts. Further, structural defects are a common occurrence. In fact, the Consumer Association Penang had complained in 2011 when the Southwest Airlines flight 812 of 1 April 2011 (again a Boeing 737) was forced to make an emergency landing at a military airport, after suffering mid-air decompression. In a subsequent inspection a large number of aircraft showed up with cracks and metal fatigue. Structural failure is a common occurrence just because the aircraft body is designed to be as light as possible, and that is obviously not the same as saying it is as strong as possible or that it is as safe as possible. Further, an aircraft being expensive, airlines continue to use it for as long as possible, increasing the chances of corrosion and structural failure. Clearly consumers ought be informed about these compromises and by how much they increase the likelihood of sudden death in the air. They can then make an informed choice. Given the above long list of demonstrated structural failures of Boeing aircraft, this possibility ought to be vigorously investigated as the lead possibility. Instead, we are being offered all sorts of exotic explanations through the press, explanations which don’t at all fit the facts. What is being examined by the FBI is the computer of the pilot (who had a long and unblemished record), not the computers of the Boeing company. A colonised mentality? or something else? There is a relation to the previous blog post. Many people felt outraged when a bomoh appeared at the airport to divine the location of the crash site. However, so many people blindly believe in experts. They do not see that in our present-day society experts are mostly caught in a conflict of interests which they rarely publicly declare. Therefore, there is no guarantee that aviation experts would tell the whole truth, especially if that truth hurts the very aviation industry to which their livelihood may be tied. And if one is not oneself an expert how does one know that the expert is telling the whole truth (or even that he really is an expert)? So, in a situation like this, blind belief in the unbiasedness of “experts”is just another superstition. Here are the reports of the press conference. You are currently browsing the C. K. Raju’s Blog blog archives for April, 2014.